Spicy Chilly: 100 Yummy Diwali Sweet Recipes ~ The e-book by Indus Ladies! 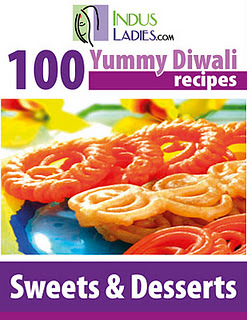 100 Yummy Diwali Sweet Recipes ~ The e-book by Indus Ladies! The special e-book by Indus ladies is now available for a for a free download here. The book will surely be much beneficial for the readers, world wide, who are on the look out for a sweet or a dessert recipe, this Diwali! My contribution, Godhumai Jira is included in the e-book along with the other tongue ticking recipes apt for the season. Thanks again to the team for all those wonderful efforts put in! Indian Diwali Sweets Recipes - If you need Indian Diwali Sweets Recipes, you can get easy & simple Recipes of Indian Sweets for Diwali at madhurasrecipe.com.